comment Enjoy exclusive access to the highest outdoor observatory in the world. What's more, this ticket allows you to visit the 148th Level, which is the highest outdoor observation deck in the world! Your journey begins when you step into the Burj Khalifa SKY lounge, from where you will be personally escorted to a dedicated elevator. Inside, watch in amazement as specially designed projections give you the feeling of flying over global landmarks as you ascend to Level 125. At 456 meters above the ground, and one floor above the At the Top observatory, Level 125 offers you a spacious deck to enjoy the stunning 360-degree view of the city. This level also houses a new attraction: Dubai – A Falcon’s Eye View, that allows you to explore the city from a unique perspective. If you thought that was the end of the fun then think again. A special elevator will take you up to the crowning experience, which, at 555 meters, is the world’s highest outdoor observation deck. Enjoy the breathtaking views as you bask in the luxury of the lounges. Witness a pioneering concept in interactive experiences with a life-size screen that envelops you as you explore different corners of the Emirate. The Burj Khalifa Sky 148th Floor Observation Deck is an extremely popular attraction and often sells out (especially during November to January), so it is strongly recommended to book your tickets in advance. Advance purchase tickets offer a considerable saving on walk-up prices and you can simply collect the tickets on arrival at the Burj Khalifa. Due to the huge levels of demand, Burj Khalifa Observation Deck tickets are on a request basis and the exact time of your ticket is not guaranteed until we confirm your booking and send your attraction documentation. If your chosen time is not available, we will advise the closest time available to your original choice. Please note, the most popular time to visit the Burj Khalifa Observation Deck is between 3.00pm to 8.00pm and these times sell out quickly. 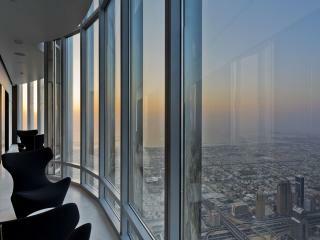 The Burj Khalifa Sky Observation Deck is open from 8.30am to 12.00am (last entry at 11.00pm).